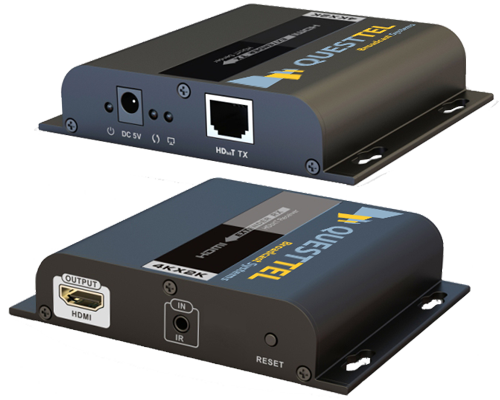 QuestTel's B-1HDMI-IP-TX/RX over IP Extender with IR allows easy extension and distribution of broadcast quality 4K/2K HDMI video over local area networks. Our B-1HDMI-IP-TX/RX extender applies HDbitT technology to transmit HDMI signals over CAT5/6 cable infrastructure, saving cable cost and making installation fast and easy. 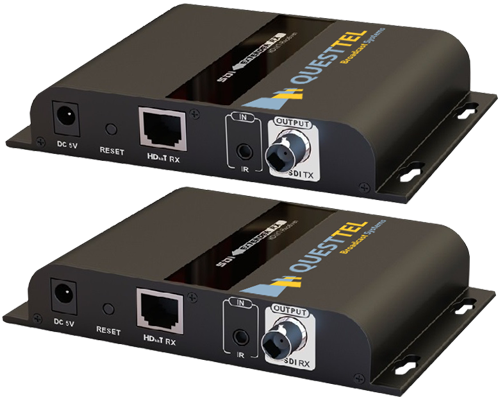 QuestTel's 3G/HD/SD-SDI over IP Extender with IR allows easy extension and distribution of broadcast quality 3G/HD/SD-SDI video with embedded audio over local area networks. Our SDI extender applies HDbitT technology to transmit SDI signals over CAT5/6 cable infrastructure, saving cable cost and making installation fast and easy. 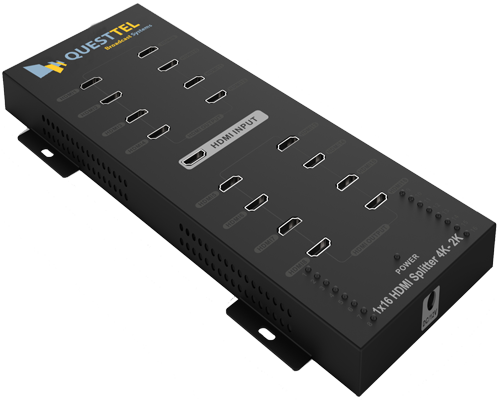 QuestTel 1x8 Ultra HDMI Splitter offers an easy to use HD video solution for Casinos, Sports Bars, Super Markets, Shopping Malls, Churches, Data Control Center, Conference Rooms, Education and Training, Luxury Homes, Digital Signage, Home Theaters. 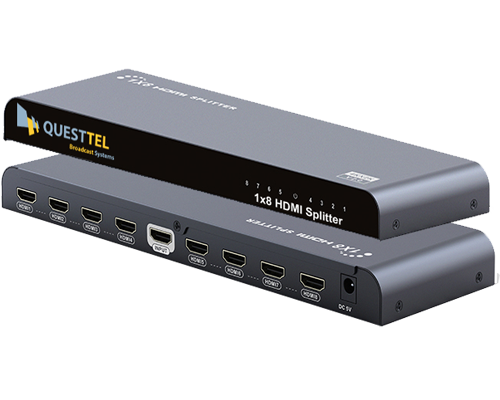 QuestTels 1x16 HDMI Splitter offers an easy to use HD video solution for Casinos, Sports Bars, Super Markets, Shopping Malls, Churches, Data Control Center, Conference Rooms, Education and Training, Luxury Homes, Digital Signnage, Home Theates or anywhere you need a solution for your multiple HD display set up. 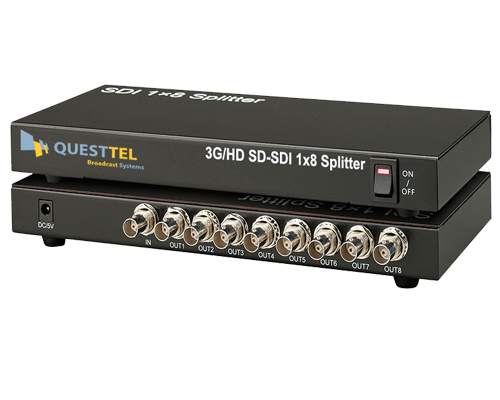 The QuestTel 1x8 SDI Splitter which make it possible to transfer 1SDI signal to 8 SDI outputs providing full HD 1080p resolution to up to 8 displays simultaneously for faster broadcasting and production. B-HDMI-4MSW - is a multiviewer solution for displaying 4 HDMI video sources simultaneously on a single monitor, this unique product simplifies many AV applications including real-time monitoring from several cameras. 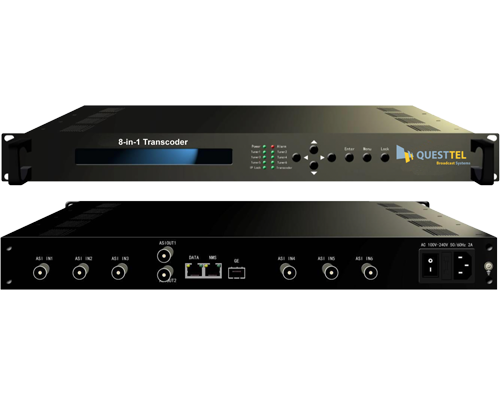 QuestTel's B-ASI-IP-TSR is a professional bidirectional transcoder to convert video between H.264 and MPEG-2 format and also to transcode between HD and SD programs simultaneously (resolution scaling from HD to SD). 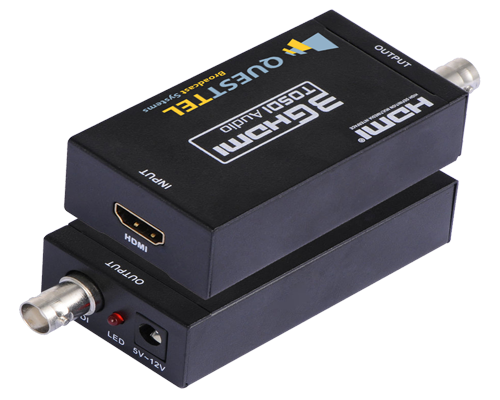 The QuestTels's HDMI to SDI Converter allows HDMI signals to be shown on any 3G/HD/SD - SDI viewing device. 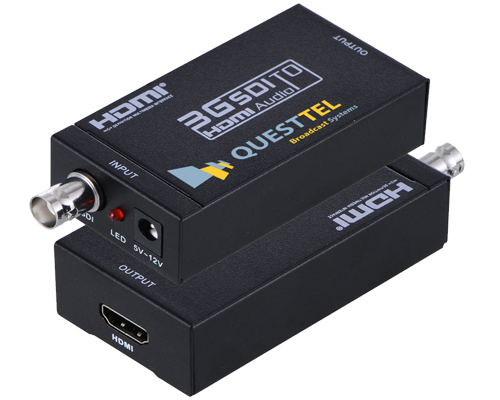 The QuestTel's 3G/HD/SD SDI to HDMI Converter allows SDI video+audio signals to be shown on any HDMI viewing device. 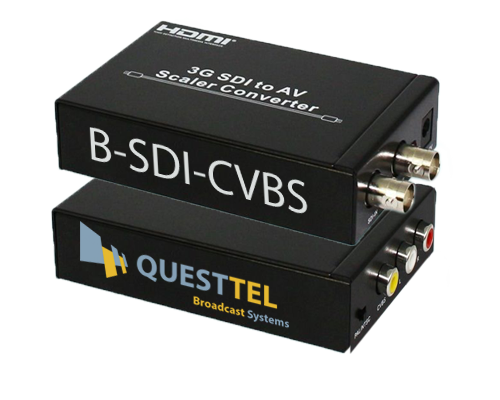 The SDI to CVBS scaler converter allows SD-SDI, HD-SDI and 3G-SDI signals to be shown on CRT or HDTV displays while ensuring high bit rates to give you fast signal transmission without any loss. 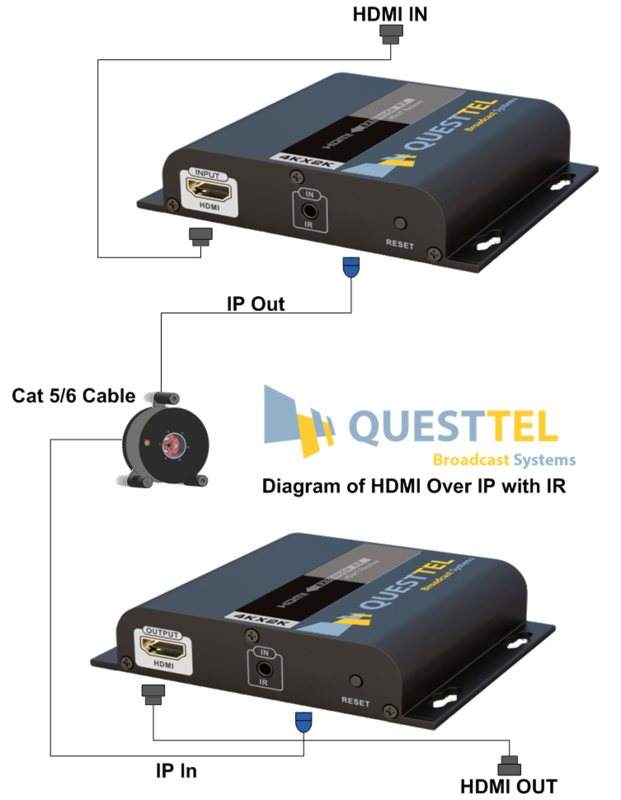 QuestTel's B-1HDMI-IP-TX/RX over IP Extender with IR allows easy extension and distribution of broadcast quality 4K/2K HDMI video over local area networks. Our B-1HDMI-IP-TX/RX extender applies HDbitT technology to transmit HDMI signals over CAT5/6 cable infrastructure, saving cable cost and making installation fast and easy. The B-1HDMI-IP-TX/RX supports IR pass-back function and it will extend HDMI signal with cascade connection. It supports resolution up to 4K@30Hz and up to 390 feet (120 meters). 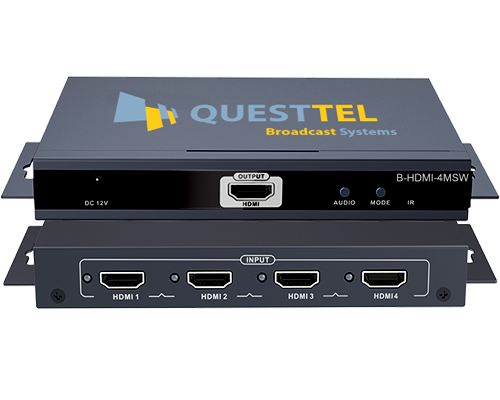 QuestTel HDMI Over IP Extender is is ideal for many quality critical video/audio applications such as original video source contribution, live video delivery around the broadcast facility or running media exchanges between different studios within the facility.